It's Illustration Tuesday. 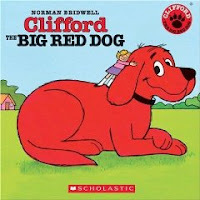 Clifford is the big red dog created by Norman Bridwell and loved by children. The direct pictures and storytelling in these books make them entertaining and accessible and very popular. Watch the author illustrator tell about how he created Clifford. He also sensitively addresses how criticism (and feeling of accomplishment) affects creative people. It's nice. And take a peek here at how many Clifford books there are!